Newly released and available for a limited time only is the rather handsome Sinn U200B. Sinn bring to this edition all their technical know-how so despite its fine and dapper demeanor it's also as tough as old boots - its watchcase and crown are made from the same sea-water resistant steel you will find on the hulls of the German Navy's submarines and its bezel is constructed from the same stuff with the added toughness of Sinn's chemical hardening Tegiment technology providing the ultimate in scratch-resistance - and it has in-built dehumidifying which means that it won't fog up just when you need it most. - But that's not all. Inside the case the self-winding ETA 2824-2 movement is protected from shocks, magnetic fields, is low pressure resistant and is capable of diving to 200m and back again without imploding. It has also been tested and proven to be functionally reliable from -45°C up to +80°C too. The 37mm case size ensures that this piece is ideal for smaller wrists and even though the neatly tucked-in positioning of the crown is part of its utilitarian design and the dial-side plainness is a must to heighten readability, these features all combine with the pelagic hue of the dial to make this one of the coolest dive watches of the season. 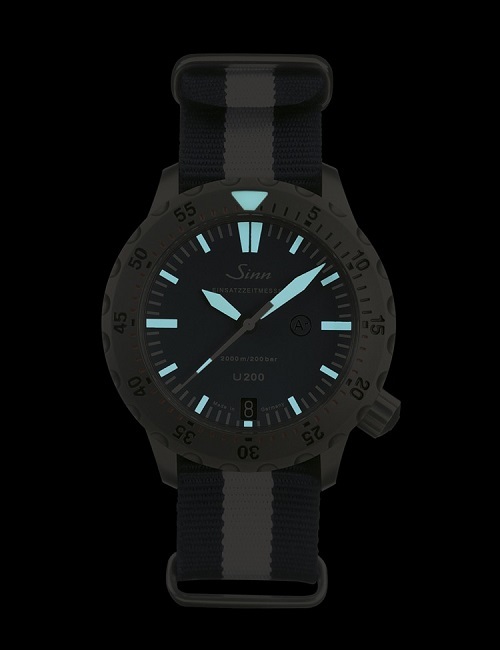 The Sinn U200B will be a time-limited edition, orders received up to 31 December 2013 will be fulfilled, also in the box is a spare strap so you can choose between rubber or NATO. More details at Sinn here.